There are two Japanese vegetables that I can't get fresh here that I miss very much. One is burdock root or gobo; the other is bamboo shoot or takenoko (竹の子 or 筍）. Bamboo shoots are very much a spring-only vegetable, much like asparagus, so around this time of year I always get a craving for the crunch and subtle flavor. An added bonus: boiled bamboo shoots are so low in calories that you can put them on your 'eat as much as I want' list. 100 grams has about 12 calories and 1 gram of fiber. If you're lucky enough to live in an area where you can get fresh bamboo shoots, here's how to cook them. Peel the tough outer skin off. Cut off the tough root end. Let cool in the water; if you try to peel it while it's still hot, the shoot may split. Any remaining outer skin should now peel off easily. You can then proceed and use the bamboo shoot in various dishes. Store in the cooking water until you're ready to use the bamboo shoots. You can get canned bamboo shoots, but I much prefer the vacuum packed kind. They are a pale shadow of freshly cooked bamboo shoots, but they haave to do. They come packed in a little water. 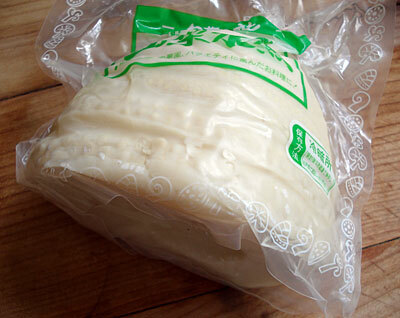 Leave the bamboo shoots in the vacuum pack until you're ready to use them. Essentially they have been cooked in the manner described above, and are ready to use. You may see some white gritty stuff in the inner folds - that's just rice residue. Rinse it out in water. 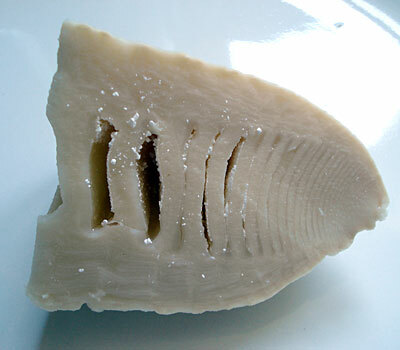 Once you've opened a vacuum packed bamboo shoot, try to use it up right away. Takenoko gohan is a quintessential spring dish. 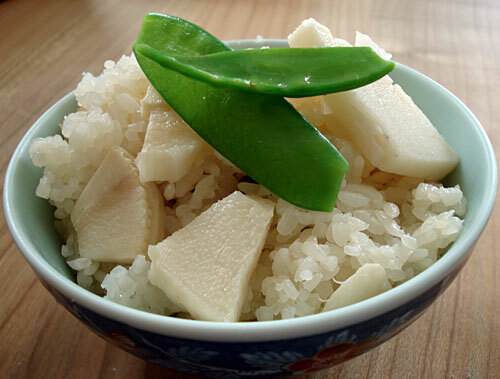 The rice is subtly perfumed by the bamboo shoot, which retains its crunchy texture. This can really make me homesick for Japan. This is a method to cook it in a rice cooker. This is a vegan dish. Wash the rice and drain in a sieve. In the meantime, chop up the shiitake and cut the bamboo shoot half into bitesize pieces. Add to the rice, and cook using regular cooking settings. Let rest for at least 10 minutes after cooking, and them fluff up to mix. The other half of the bamboo shoot can be used in a stir-fry or a miso soup. Here's a simple stir fry that uses another spring vegetable, snap peas. The bacon makes it not very vegetarian. You can leave it out for a vegan version. Head up the oil in a wok. Add the bacon and cook until just about crisp. Add the onion, stir fry a couple of minutes. Add snap peas and stir fry until bright green and crisp-tender. Add bamboo shoots, soy sauce and salt and pepper, and the chili oil, and take off the heat. Submitted by maki on 2008-05-16 18:22. I managed to get a fresh bamboo shoot last spring, but it was probably old 'cause it was sort of bitter. The vacuum packed ones are easy to come by here in Michigan. But last month I came across a vacuum-packed version of miniature bamboo shoots that I never saw before or since. Check out the 20 April 2008 entry on my blog to see a picture. They didn't have much flavor, but perhaps I cooked them wrong? When buying just taste it if bitter dont buy. lot of variety of bamboo is availavail. What does the starchy water do to the bamboo shoot? The reason why the bamboo shoots are cooked in the rice-washing water or with rice bran is because it helps to get rid of the bitterness in the shoots. Tess you may want to try that next tme with the fresh bamboo shoots. Bamboo shoots do have a very subtle flavor - the texture is the thing that is most enjoyable - though the fresher the shoots, the more flavor there is. I wandered to the local Asian store last night and picked up one of the vacuum packed ones and made the snap pea stir-fry (subbed out sliced pork chop for bacon 'cause I had pork chops but no bacon). It was really, really good, and I'm going to have to make this part of my spring food menus. Tonight's dinner is going to be grilled pork chop with sides of raw snap peas and bamboo shoot rice. My wifes family planted some giant timber bamboo in our back yard in the 60's but its been in a contained area so its very root bound. Every year around this time, we have local asian people come by and ask if they can take the shoots. I decided to try and get more information on how to cut and prepare the fresh shoots because we have so many coming up. They are not very big like all the pictures ive seen, but some of the instructions on cooking and cleaning them are not very clear. Please Help! We love em! If I remember right from when my aunt's relatives used to cut bamboo shoots, you cut them off right at the ground level or a bit lower with a sharp knife, saw or even a small axe, depending on how large the shoot is. Then just wash it off very well to get rid of the dirt, and cook as described above in rice-water until tender, in the skin. It's tender when you poke through the thick end with a skewer and the skewer goes through. This may take an hour, or less or more, depending on the bamboo shoot. Give it a try! If that doesn't work, why not ask someone who comes to ask for the shoots how they prepare it? I have a lady here right now getting bamboo shoots - I asked how she cooked them. She peels outer layers, said she steamed(but I think she boils) for about 30 minutes, removes from water(this is why I thinked she boils-not steams) til tender. Cools, slices and ads to whatever she wants them with. She said she usually stir frys chicken and pork and stirs fries the bamboo with them. Use whatever spices/etc to suit your taste. ... I just can't stop loving this website! I learn something new everyday... Thank u so much! I hope this doesn't make you miss it more, but I currently live in Akita-ken and in my town there is actually a takenoko matsuri this coming weekend. I'm sad to be missing it, but I know there will be great food there like takenoko tempura with other yummy veggies mixed in. But, i'm happy for this link because I've wondered about cooking it. Although the takenoko that is popular around here is the smaller, golf pencil sized shoots. I'm really clueless to cooking most Japanese veggies. the only things I've gotten down in my repertoire are tonjiru, oyakudon, and shougayaki, oh and severely bastardized takoyaki with cheese and wiener in them when I don't feel like dealing with tako. And thanks for this great site! My friend just linked me! I'm so glad that your blog is out here! Just yesterday, I found some fresh bamboo shoots in our local deli and bought one. When I dug through my not-so-small collection of Japanese cookbooks today, although quite a few rave about fresh bamboo in spring time, only one book had a short comment about its preparation: Yoneda writes in 'The Heart of Zen Cuisine' (a book about vegetarian temple cooking): "Preparing the raw shoots is complicated and need not concern us here." Thanks for nothing! I'll let you know the result. I'm off to wash some rice and cook some bamboo now! Re: Saved by the Blog! hihihihi, believe me, i worked in that temple's kitchen, and this is exactly how the bamboo is cooked there, with rice bran and red pepper. except that the quantity is HUGE, you should see the size of the pans they use... I think the Abbess Yoneda meant that the whole process including digging the roots up every day is quite a job in such quantity. You guys probably get the small roots in shops but in the garden temple, those babies are HUGE. as big as my leg. HEAVY too. So yes, quite a process! but yes, oh soooo good when cooked ! i hope you enjoy the recipes in the book, feel free to adapt them to your own taste! Hi Maki, I was wondering if you could help me out on this. I bought what I thought were fresh bamboo shoots, but somehow after taking them home and slicing them, they looked more like 'bamboo roots' than bamboo shoots, and they tasted more like a crunchy potato instead of the special fresh bamboo flavour. Also, they lacked the 'ladder' which is so pretty in fresh bamboo shoots. Here is the picture: http://www.flickr.com/photos/kattebelletje/3068874826/. So.. could is be? The characters read 竹薯. Thanks! I am not too familiar with them, but I think they are a Chinese vegetable and they are actually roots, not bamboo shoots, but are called what they are because the ressemble bamboo shoots. Hope that helps! I love these! My mom cooks them Indonesian style by adding about 4C of water to about 2.5 - 3C of julienned bamboo shoots, and Indofood seasoning (Racik - Lodeh). Cook till tender then add 1/2 packet of instant coconut cream (SunKara brand - 1 small triangular pack which equilavents to cream from 1 coconut) at the end of the cooking process. It's really easy and and so tasty such that I could just have that with rice for more than 3 days in a row.. I live in Manila, and we have fresh bamboo shoots available all year round. They come pre-sliced and look like flat yellow egg noodles. They have a strong barnyard smell (if you have ever smelled cow or horse pee, you'll know what I mean). Will boiling in rice washing water help get rid of the smell too? An aunt says to just boil the bamboo shoots repeatedly in several changes of fresh water. I got rid of mine by boiling in fresh water several times. They did not go off completely, but least, there's much less pungent smell in them. I've got lots of bamboo in my yard... nuisance... but today I ate some. Five days ago I cut and discarded all the shoots I could find, so that today's shoots were less than five days old. I broke them off by hand. If they didn't break, tough, I didn't use them. My bamboo is about an inch in diameter. I cut off 2 1/2 inches of each and peeled away all the leaves. I sliced cooked it only a little... probably could have cooked it more to remove the astringency. But it was tender and good. The secret, I think, is to be sure it is less than five days old and breaks off easily. Actually, the bamboo shoots that are eaten in Japan are dug out with very heavy shovels or even a　long-handled axe like thing, because they can get big! I saw them doing this once in the Chichibu area of Saitama prefecture where one of my aunts is from. Here's a website of a place in Chiba prefecture in Japan (not that far from Tokyo) that offers a takenoko (bamboo shoot) digging experience (like pick your own strawberries) - you can sort of see the long handled implement they're using to dig out the takenoko, and the big takenoko themselves! I'm cooking bamboo shoots right now that I harvested this morning. I planted a grove of giant timber bamboo about ten years ago and now I look forward to my fresh crop of bamboo shoots every spring. Basically the shoots I harvest are the ones that are trying to invade space I don't want them to enter. I just kick the shoots off when they are about 6" to 10" tall. Peel the raw outer leaves(maybe the first two leaves) then start slicing very thin slices across the grain until you can feel your knife start to cut fiber. Then peel two more leaves and slice again until you feel fiber. Continue doing this until you reach the tip. I saute the slices in olive oil over medium heat with a thinly sliced onion and a thinly sliced chile pepper (I prefer poblano or anaheim) and also a spoonful of roasted minced garlic from a jar. I saute this mixture very thoroughly until everything is very tender and a golden brown and salt and pepper to taste. Delicious and a meal in itself or a great side dish. P.S. I live in Gaffney, South Carolina and I am now starting to get more shoots than I can eat. If you live close to me, contact me, you can have my surplus. i am in north carolina and would love to share your shoots! i guess i will have to wait until next spring, but thank you for your generous offer! What is the colour of the vacuum packed bamboo shoots should normally appeared like. Isit dark Yellow or off-beige shadow look? Because I just bought two vacuum tin packed of winter bamboo shoots and I am surprised it has a strong yellow birght color. Bamboo shoots should be beige, maybe light yellow-brownish. Check the can ingredients for added food coloring - bright yellow sounds like it's been colored. 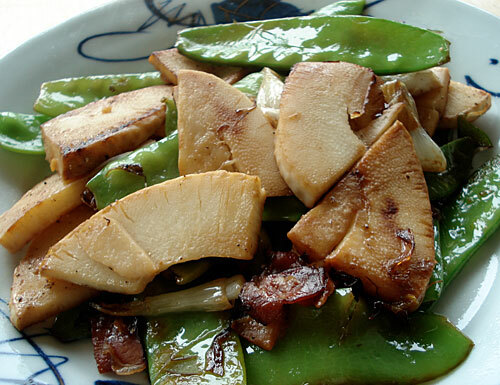 What's the easiest way to prepare canned bamboo shoots, shelled edamame and canned mushrooms without stir frying? I think the easiest thing to do with those is to put them in a soup! Thank you for the suggestion. I was thinking of a comment I once saw on the internet that said bamboo shoots go good with edamame. I wish I looked at the recipe. I'm planning to make a sidedish for Thanksgiving dinner by slicing sashimi style bamboo shoots and abalone like shell fish. The dipping sauce will be shoyu mixed with wasabi. But I don't know how edamame would fit in. Any ideas? By the way, I once knew a lady named Maki who studied cooking in France. just made both dishes this week! its spring and here in shanghai bamboo shoots are sold all over the place now. i do cook a lot of your dishes but sometimes they turn a bit chinese, cause i have chinese soy-sauce ....:S still very good though. i love all the vegetables-entries of your blog, they are so good. if i see a certain vegtable here on the market, i'll search your blog for a entry on it! while bamboo season is on, i'll try to make my version of springrolls, but i'd like to use tofu-skins, and add some mashed potato in... ! Ahh thank you! I just received my first 竹の子 today at work - one of the mothers of a juku student brought in a big bag, and though I took the smallest one, it's still huge! This post really helps; I'll make bamboo rice this weekend. how go I know if my bamboo ts an edible type? Hi! I'm the editor of the Ishikawa JET cookbook project. A bunch of us tried these recipes and were wondering if we could have permission to adapt them for our cookbook project, which is meant to be a resource for local JETs by providing recipes one can make in Japan. Please email me at the address provided. Wow! I really like this web page. I am doing a paper on bamboo and reading the information here is really helpful. Is it okay if i were to use some of the information from this page in my paper? Anyone who has a bamboo shoots in chili oil recipe PLEASE post here or better email me at titanic0711@comcast.net - I will be very grateful! Thanksssss! Thank you for much for the editorial!! I just bought some pre-cooked bamboos shoots yesterday and when I saw the white grainy stuff inside, I freaked out! Born in Taiwan, I've eaten bamboo shoots all the time, but have never cooked them. In the States, we have them in cans but this was the first time I purchased them at a market in Japan. I figured the white stuff was mold or something and was JUST about to throw them away when I decided that the internet might have answers. Your blog and especially PICTURE of the rice grains were exactly what I needed!!! I cooked and ate up the bamboo shoots happily. I love cooking, and especially Japanese cooking, so THANK YOU! "You may find chalky white stuff between the segments of bamboo shoot. This is an amino acid (tyrosine) congealed. Tyrosine is not water soluble and is contained abundantly in the bamboo shoot itself. As such, it is not harmful and OK to eat but, for a better presentation, you may want to wash off most of the visible ones." Now that it's springtime, I am excited to make this recipe again :) I have no Japanese heritage, but really love the simple grace of Japanese cooking. In a recent post, you talked about "foods that heal" - for me, this is one of those meals. Very comforting, and healthy! As always, thanks for sharing your website - I love your blog and the recipes and the photos, and now your book too! Hi, I do like shiitake mushrooms but I enjoy the chinese version much more for the sweeter taste and tougher texture. I was just wondering if I could substitute the chinese mushrooms instead. I enjoy reading and trying your recipes but I was aslo wondering if I can substitute long grain Chinese rice instead of Japanese rice because I am not looking for a traditional Japanese recipe but rather one that tastes good. Thanks in advance for your replies. For me, subsituting long grain rice for Japanese-style rice (and actually, "Chinese" rice is not really long grain either, it's another kind of medium-grain rice) is an absolute no. I would not use Japanese style rice in an Indian recipe that specified basmati either. Rice types taste so different, it's worth while seeking out the right types for it to really taste as it should. You might find my Looking at different types of rice article helpful. I'm out of vegetables and I don't feel like going to the store. I wonder if I could eat the bamboo shoots growing in my garden. I look up the species (Phyllostachys bissetii - I planted it 10 years ago) and see that the shoots are indeed edible. I search for bamboo recipes online and find your blog. Yippee! I go outside and harvest some shoots. I peel off the outer leaves, and they are quite tender inside. So tender that if I cooked them, it would turn to mush. So I put a little lemon juice and oil on them and made a yummy salad of sliced (raw) bamboo shoots! Live in Kanazawa and am blessed with fresh bamboo shoots everywhere. Will pick some up this week since seeing your blog. Cheers! What is rice-washing water? I may sound silly for asking but honestly I have no idea. I don't wash my rice. It comes in a sealed plastic bag. I read elsewhere that you should cook bamboo shoots with white rice and chili peppers to remove the bitterness. Is that the same thing? How do I know if the bamboo in my backyard falls into the "edible" quality? Thanks! raw bamboo shoots are actually toxic. They contain a toxin which is neutralized by cooking. There are AT LEAST 108 specie of edible Bamboo. the information at the top states 2-3! That is Far far from peoples experience worldwide. Bamboo is a great food source. I have grown 10 different Timber Bamboos and most are great. I Read this with interest! Amazing to see the different ways of cooking bamboo shoots.The ones you get here in the local market have been smoked and dried.I place in a pot, cover with water and bring to boil for about an hour, Pour that water, rinse with cold water, cut out the joints(hard bits),cut the soft bits into small pieces, add about 1/4 tsp of baking soda and bring to boil again for 1/2 an hour. The tender bamboo shoots should be ready which you can add to the traditional groundnut sauce and served with rice or 'matooke'(kind of plantain).OR you can choose to add the bamboo shoots to any other vegetables. With experience and adventure in global cooking, one can do any thing with the bamboo shoots. How more rich could they be? I´m living in southern Chile for a while. Here groes a wild bamboo all over the place called Colihue. I by chance saw and tried to cook those shoots (brotes in spain) I found in my backyard and liked them a lot. Fast forward to January 2013 - I love the recipes on your site, and just made the rice and stir-fry with a huge, beautiful fresh shoot bought in the Chinese mega store in Ann Arbor, Michigan. Very delicate, haunting woody flavor. Here in Germany you can buy winter and spring bamboo shoots in asian grocery stores frozen. ive got last night bamboo shoots,you should also in butajiro or tonjiro its smell good and delicious,cut into tiny pieces,add misu,with takenoko gohan its yummy. Thank you for all these information about bamboo shoot cooking and nutritional benefits. Luckily I have lots of bamboos in my back yard and want to try cooking and eating. I hope those are edible ones. Thank you so much for the tip about the white spots being rice -- I cut mine open tonight and got so worried it was mold! You saved me from wrongly throwing it in the trash. It made for such a tasty stir fry!